I love when an idea just pops into my head. I'm hell bent on trying it out. I usually destroy the cleanliness of a room when the motivation hits me. This time, I had a package of tan tea towels that I had been saving for Christmas. Then, I had the AccuQuilt Go Feather Die in my supply downstairs. 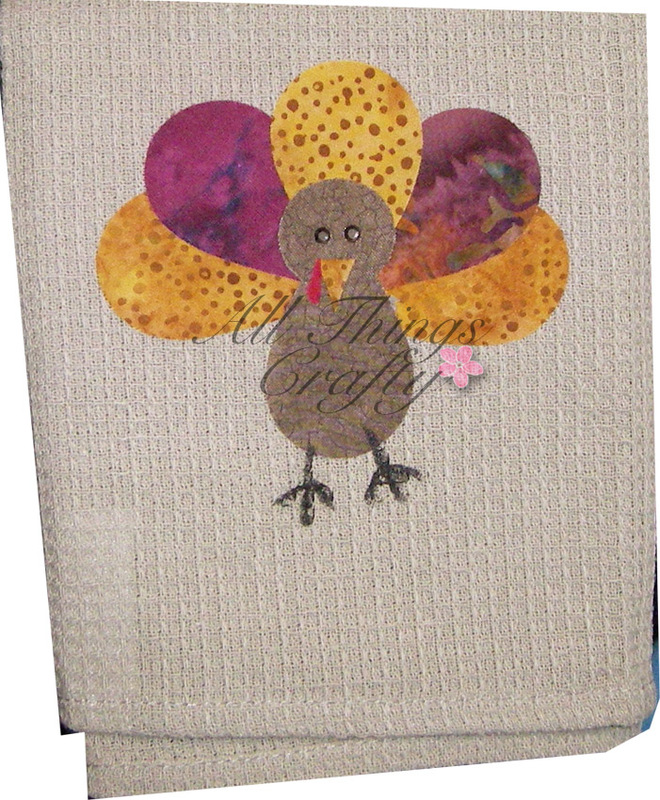 Add to that a variety of fall color batiks and I think Turkey!! I went easy with a black permanent fabric marker for the feet. Cut your first square of fusible webbing enough to cover the 3 cuts of the non-curved feathers on the AccuQuilt Go Feather die. 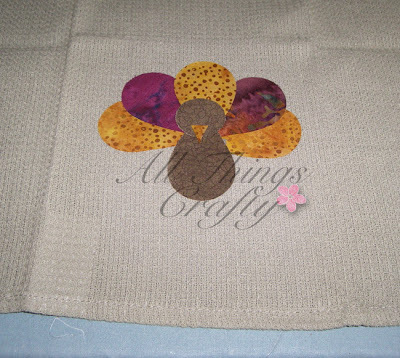 I cut 3 feathers of each color fabric so that I can make a couple of these to give to friends and family. I probably should have started sooner on this. 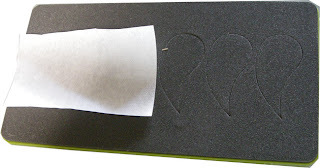 Remove one layer of paper from the fusible webbing if using Lite Steam a Seam 2 like me. 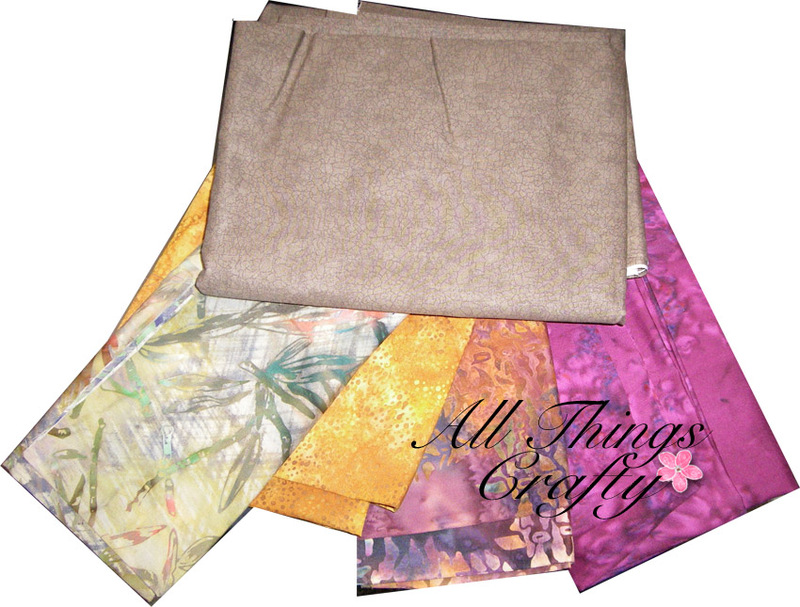 This will leave one side sticky to grab the fabric. Place the fusible web over the feathers with the sticky side up. 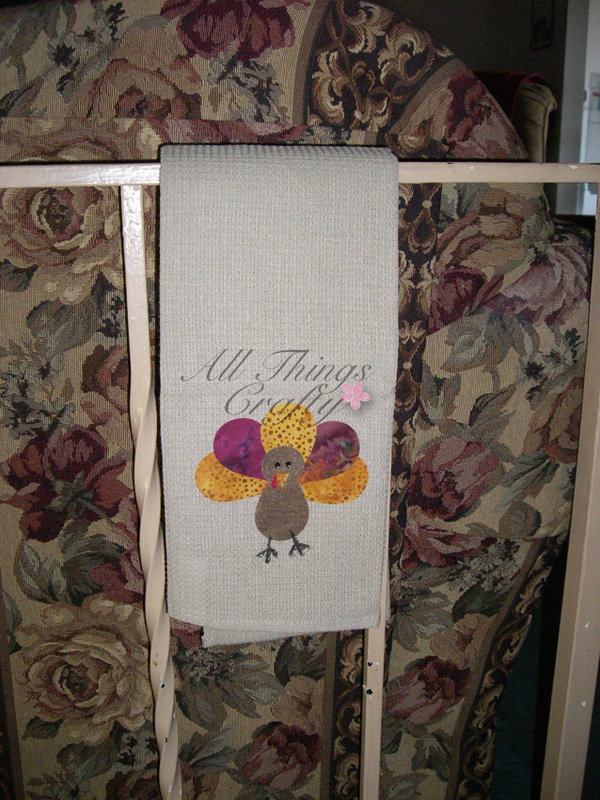 Cut your first piece of fabric for your feathers and place on top of the fusible web which is also on top of the feather dies. Make sure your fabric is right side up. The fabric side you want to see on the turkey is facing you as you place it on the fusible web. Send the die through the AccuQuilt GO and there you have your first 3 feathers. Repeat so that you have your five colored tail feathers. You can make them all different or same, it's totally up to you! Now, repeat the process only using the brown body fabric to cut out at least two feather shapes for the turkey body in brown. If you have a used a beak color fabric (yellow or orange) on one of your feathers, snip off the triangle end to one of the tail feathers you will be using. Don't worry, it will be covered. 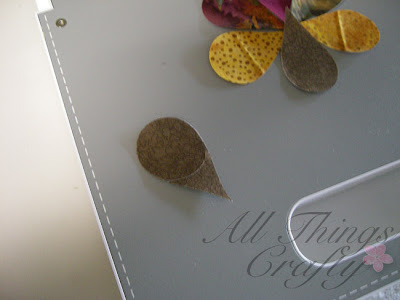 Remove the paper backing from the feathers to reveal the cut feathers and matching fusible web. Apply 5 feathers to your towel in an arrangement you feel suitable. Don't iron down yet. 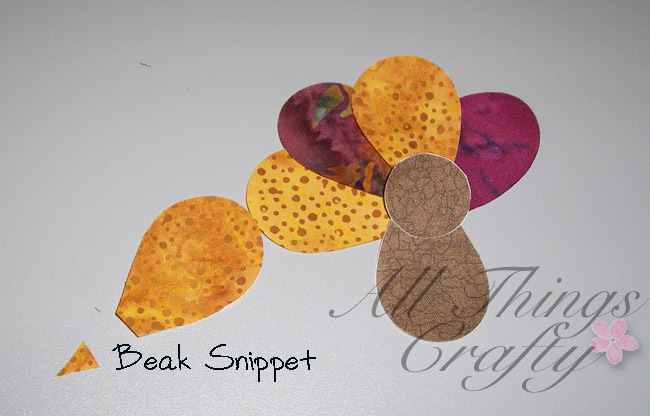 On one of the brown body feathers, trim the larger feather area into a circle for the head. Don't make it too small. Remove the paper from the brown feathers exposing the fusible webbing on the fabric. Place the full feather upside down to make the turkey's body. 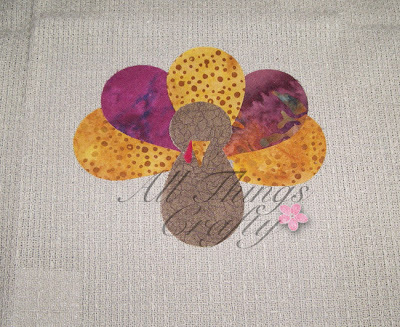 Place the cut feather circle above it to make the turkey's head. 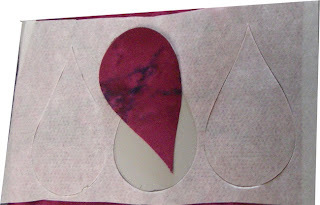 Remove the paper to expose the fusible webbing on the tiny triangle snippet and place in a preferred location on the head to serve as the beak. When all are pleasingly positioned for you, iron them down. Be careful not to drag the iron and move your feather placement. Once all is fused down, take a scrap of red and add some fusible webbing to it. Free cut a tiny teardrop to serve as the "red hangy thingy" on the turkey. Finally, add two eyes. I used rhinestones but I'll remind the receiver to always check the towel to make sure they haven't come off. You could always be safer and sew a knot for the eyes. Also, I used a black fabric marker for the feet. You could always stitch in some feet. 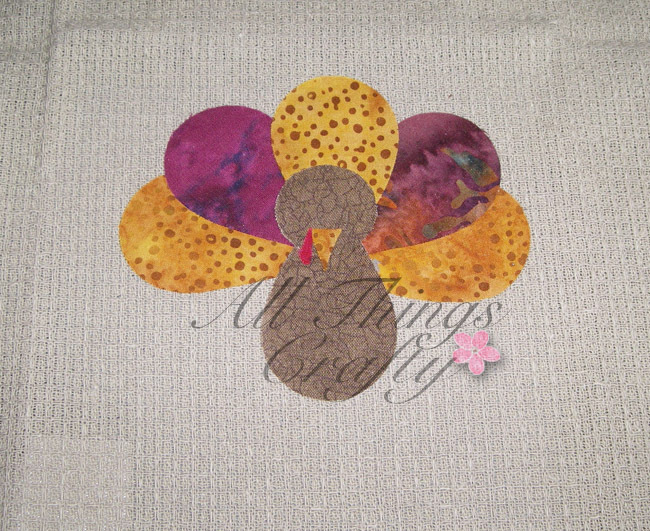 Last step is to sew down the sides around the turkey. I didn't complete this step yet. There you have it, a Teardrop Tom Turkey Towel for Thanksgiving. I hope you enjoyed it. If you make one, please come back and leave a comment with a link so everyone can see your turkey! !